Well hello girlies! It is a bit early in the day for me to be posting, but we got sent home from work around noon today because there's another bad snow storm going on. 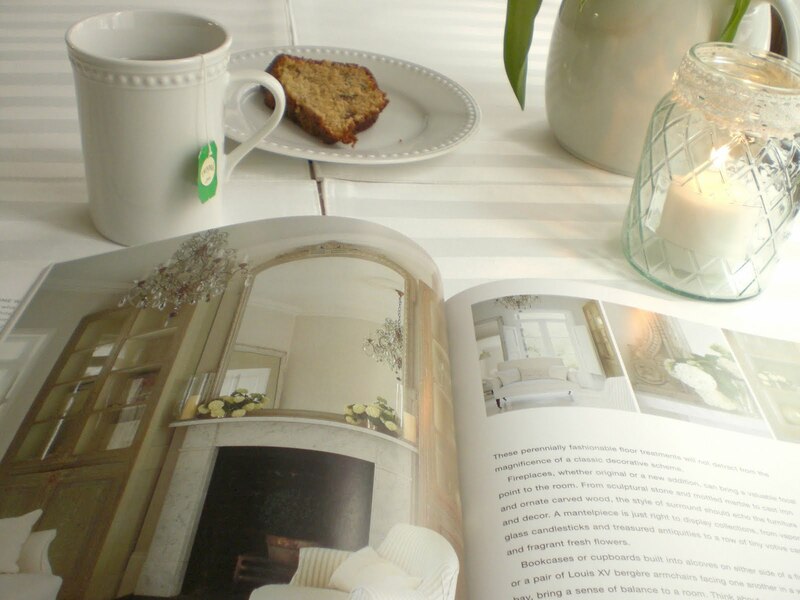 So here I sit, wrapped in a snuggly blanket, sipping tea, watching the snow fall and browsing one of my favorite decor books. 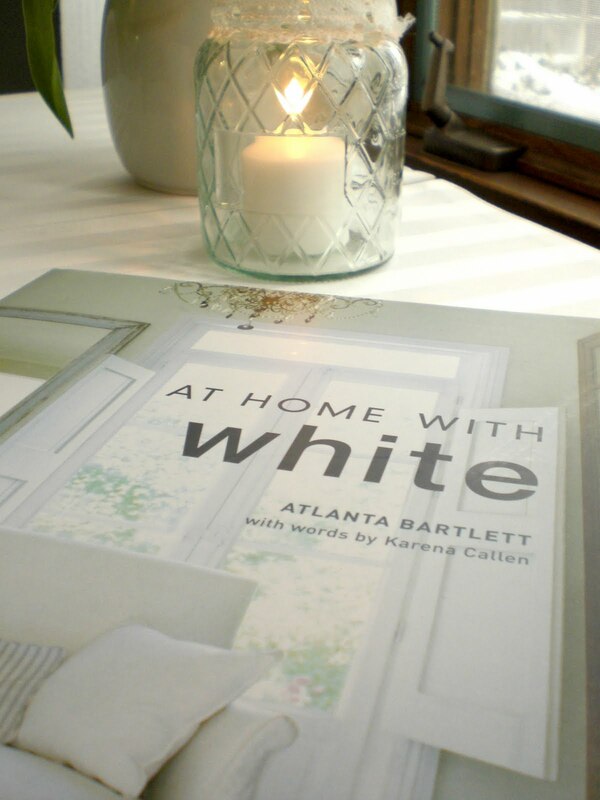 At Home with White by Atlanta Bartlett. 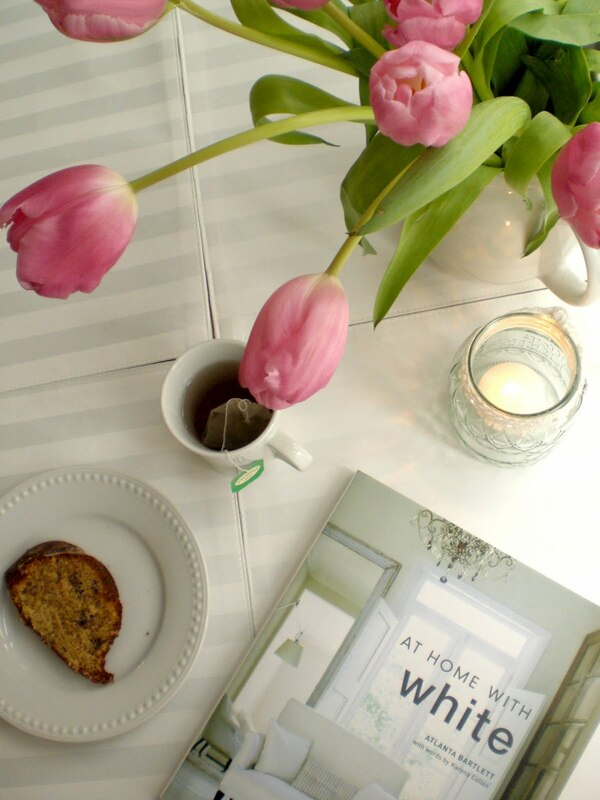 Shhh...don't tell anyone I told you but there's a giveaway coming to this little blog in the near future and you could win your very own copy! 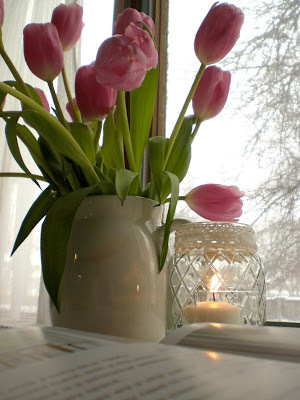 I love the way the pink tulips look against the stark snow outside. 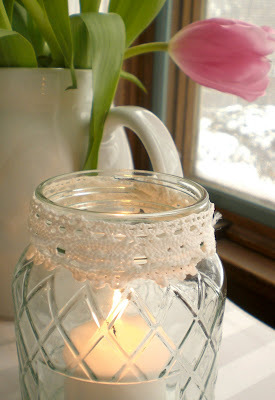 I added a bit of lace to my favorite jars to make a pretty votive holder. 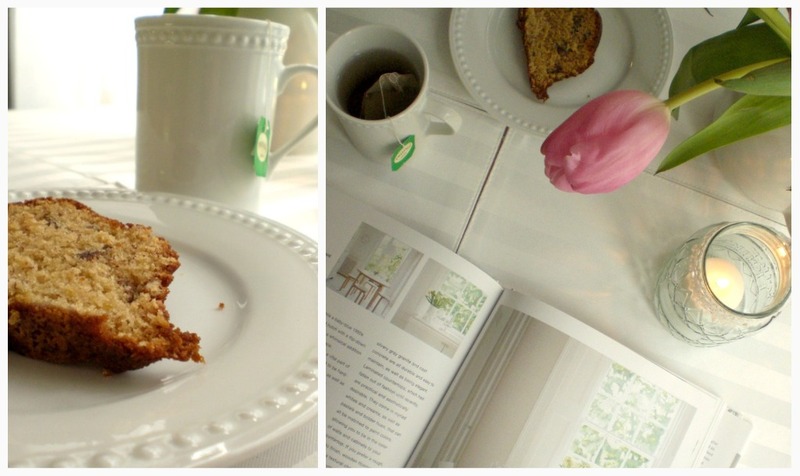 My mom's banana bundt bread is delicious, especially with hot Irish Breakfast tea. My mom and I have just been enjoying a quiet afternoon chatting and relaxing. A pot of yummy chili is on the stove, and I think a girly movie while snuggled on the couch is in order for later. 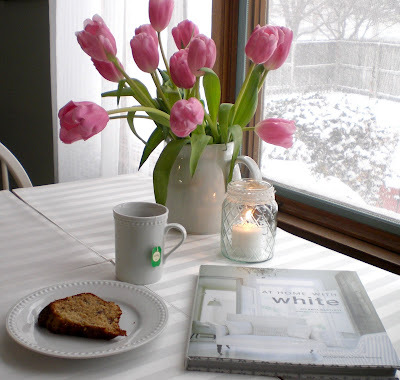 Mmmm nothing like a good snow day cozy inside. I did promise you I'd introduce you to a new friend today, and don't worry I still will! Snow days mean lots of time for blogging : ) Check back soon! I'm linking to Tuesdays Treasures at My Uncommon Slice of Suburbia, Good Life Wednesdays at A Beach Cottage, White Wednesdays at Faded Charm and Masterpiece Mondays at Boogieboard Cottage. Ooh that is the perfect setting for a winters day. 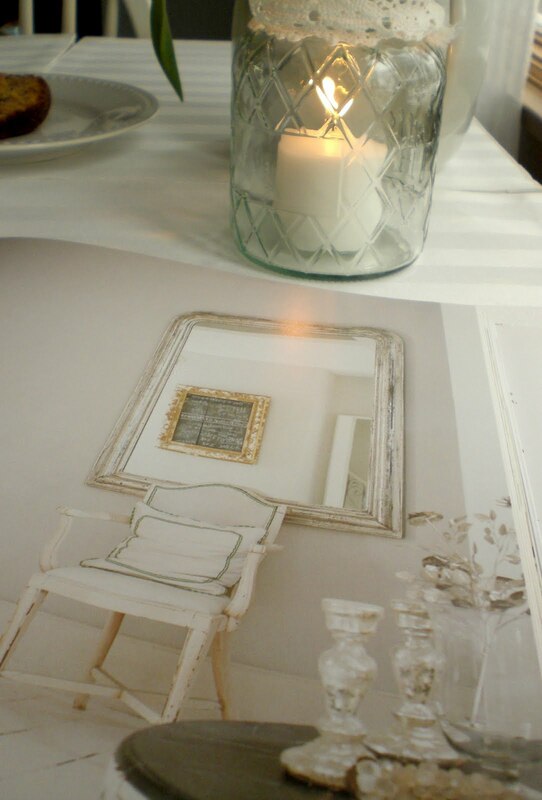 I can smell the chilli, that candle is lovely. The flowers are perfect, I wish I was there. Great that you get quality mum time. I'm envious. And to have "Living With White", I covet that. You're making me look forward to winter. A beautiful post Courtney. Looks SO cozy!! I wish it would snow here. It hasn't in a while and I'm bummed because we were supposed to have a harsh winter. Ah! You're so creative! What an awesome way to spend a snow day! Mmmm! That looks like an absolutely lovely way to spend an afternoon! I wish my Mom lived here so I could spend a snowy afternoon with her, sipping tea and chatting! That book looks like it is full of eye candy! That is such a pretty and cozy scene! I've been a bit jealous hearing about everyone's snow days while I sit here in the sun. It's hard to feel cozy when it's in the 70's outside! I really love the images in this post!! New follower.